For special-looking outdoor photos, you need one thing more than anything else: a magic hour. One of those is called the blue hour, a period of soft light that most outdoor photographers consider is one of the best times to take photographs. All you need is a camera with some degree of manual control and a tripod, together with an alarm clock for getting up early. The blue hour occurs twice each day. It refers to a period of time just before sunrise when the sky turns from a deep twilight to dark blue and then to light blue just before the Sun peeks above the horizon. It also describes a time just after sunset when the sky changes from light blue to dark blue into a deep twilight as the night sets in. So, if you're not a fan of early starts, the evening blue hour is for you. The blue-ness is caused by the fact that when the Sun is a specific distance below the horizon only its indirect blue light is visible. That's because blue light waves have shorter wavelengths, so blue light scatters in the Earth's atmosphere. What kind of photographs benefit from the blue hour? The soft light benefits any outdoor shot. It's a great time for long exposure shots; it's possible to produce the milky water effect on rivers, rapids, waterfalls and oceans without having to put an expensive and fiddly ND (neutral density) filter in front of your lens. After all, there's no need to lessen the Sun's light. Reflections on water can look especially ethereal at this time of day, especially if you can use a long exposure. During the blue hour, brightly lit cities are temporarily set against a brightening sky, so it's possible to expose for both. 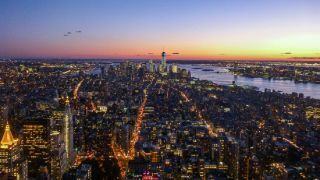 If you're in a city with observation platforms, such as the London Eye, the Shanghai Tower or New York's Empire State Building, always go up just before sunset (most aren't open for sunrise). The low light levels during the blue hour also make it a great time to capture a magical moonrise. Best done around the night of the Full Moon (or just before the following dawn) when our satellite rises and sets with the Sun. It's the only period of the month when the Moon isn't a super-bright orb in a dark landscape (something that makes exposing for both almost impossible). Instead, a softly-lit orangey Moon sits against a light blue sky, so you can photograph it and the surrounding landscape with the same exposure. About two weeks later either side of New Moon is a good time to take landscape photographs that include a slim crescent Moon, again during the blue hour. What camera settings should I use for the blue hour? Since light levels vary enormously during this brief period when ambient light is rapidly changing, settings are hard to pin down. However, since you'll probably be going for a reasonably wide-angle landscape or cityscape shot, set the aperture to somewhere between around f/9 and f/14. Keep to ISO 100 or 200, especially if there's artificial light in the image, otherwise the finished images could be noisy. The shutter speed will depend on what effect you're going for, but when the sky is a deep blue – furthest from sunrise or sunlight – we're talking five or so seconds for your camera to get enough light. Whatever shot you take, be sure to shoot in Raw format because only in post-processing will you be able to tease-out the clarity, shadow detail and delicate reflections your camera captures. How does the weather affect the blue hour? Weather plays a key role here, as the blue hour has a far more amplified effect in a clear sky. That doesn't mean you need absolute clarity though, because cloud formations taking on a pink hue can add to your photography during this time. A clear horizon is necessary for photographing a moonrise, but urban photography is unaffected. How long does the blue hour last? It's actually not an hour. How long it lasts depends on where you are on the planet, and at what time of year, because it's about how quickly the Sun rises and sets. There's no hard definition because the angle changes constantly, but the blue hour is roughly when the Sun is between -8° and -4° below the horizon. You can picture how much that is by making a fist and stretching that arm out in front of you (humans are all made to the same scale, so an outstretched fist will always measure about 5°). However, how long the Sun stays in that position depends on where you are. For example, if you're near the Arctic Circle in winter, the Sun doesn't move far below or above the horizon, so the blue hour can last for many hours. Conversely, if you're on the equator, the Sun rises and sets very quickly, so and the blue hour is always very short. As a rule of thumb it lasts about 20-30 minutes, though even during that time the light levels will increase rapidly as dawn approaches, and decrease sharply as it gets further from sunset. It's a phenomenon that is at its weakest closest to either sunrise or sunset; there's a definite terminator point about 10 minutes before sunrise when the blueness of the sky’s blueness fades very quickly. At that time, your shutter speed will need to get shorter with every single photo you take (and the opposite applies after sunset). Since the blue hour is a fleeting phenomenon offering only a small window in which to photograph something, any photographer wishing to use it properly has to know when it's going to occur for an exact location – and get in position ahead of time. Luckily, there are many websites that help, such as Blue Hour Site and The Photographer’s Ephemeris (TPE), which allows you to see exactly how light will fall for any location. The shot-planning app PhotoPills is also worth investigating. For details of moon phases, and dates of Full Moon and New Moon (which are the same for any location on Earth), Timeanddate.com is a great help. If you've planned a shot to coincide with the blue hour, you should also get to know the golden hour. This refers to the period just after sunrise and just before sunset, when the light of the Sun is at its softest and most colourful. It begins or ends when the Sun is about 6° above the horizon, and at the point of sunrise or sunset. During this time the light from the Sun is muted, and though it's called the golden hour, soft oranges and reds can become quite intense. Armed with some knowledge of what these magic hours are – and an idea of exactly what you want to photograph during them – these periods of soft, diffused light can become a period when you can be at your most creative and accomplished.